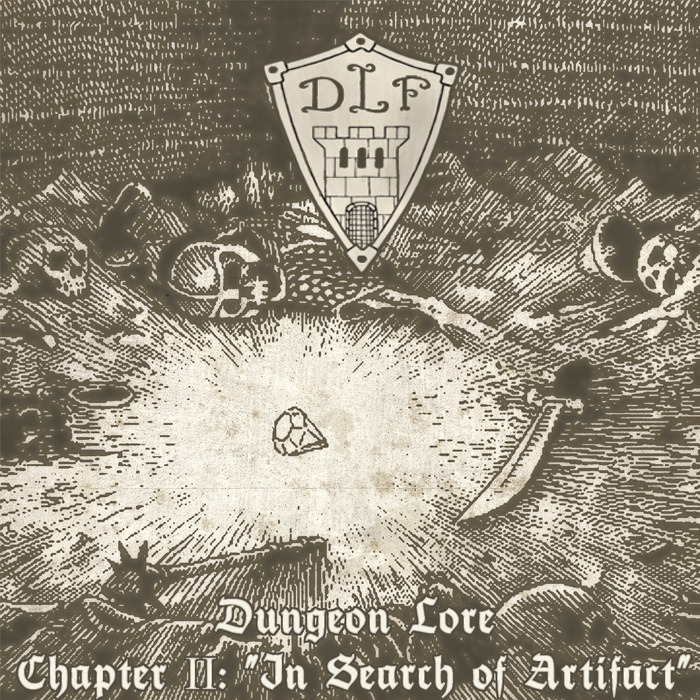 Dungeon Synth: Dungeon Lore Foundation - Chapter II: "In Search of Artifact"
Dungeon Lore Foundation - Chapter II: "In Search of Artifact"
In a deep cavern you wander, torch in one hand, blade in the other. After a long while you discover a hidden treasure, barely illuminated by the low flicker of your torch's flame. You approach the half-buried wooden chest cautiously, always wary of traps, and upon opening it you glimpse the lost artifact, glowing of its own mystical power. Is it cursed or enchanted? This is the second original compilation album from the Russian dungeon synth community. It starts out with a very rough synth, perhaps as a warning to the casual listener. The rest of that track is quite mellow and pretty, however. And this contrast is consistent throughout the compilation, a well-balanced mix of raw, growling tones and richly layered pads. There's a similar balance of production complexity in the compositions themselves, providing what seems to be an accurate reflection of what's coming out of the community, with some tracks being highly ornate and mastered, and just as many seeming very primitive and immediate, and those lines blur often even in the same tracks, creating a very dynamic and fluid experience as far as compilations go. What this album does well is conveying a sense of ancient mystery. It captures the otherworldliness that would be expected of an artifact bearing magical powers, and it causes one to imagine the even more mysterious realm of this object's birth. And so by hinting at a further mystery, rather than fleshing it out, this album creates a sort of enigmatic depth that is very effective. There's also something vaguely familiar here, not of other dungeon synth, just that it has a sense of being eternal, especially on tracks like "For the Fern Flower" and "Hardening In The Flame Of Dragon," which have a particularly eerie mood of nostalgia. I've been enjoying this album very much. There's not a bad track here, and despite the specific theme of "artifact," the moods are still quite varied and dynamic. I'd say this is an improvement over the last compilation, which was already quite good. It's also simply a useful exposure to the new crop of Russian dungeon synth artists. It's worth checking out, for sure. Thanks for the review, it was a very enjoyable journey through the genre. I just bought both of these, inspired by this review. Haven't had a chance to take a listen to either yet but should be interesting. I'm interested to hear what you think. I feel like these compilations are pretty representative of the kind of stuff the Russian community has been producing in recent years.